There was more drama in the bedroom as Leonel tried to break down Macky2's walls. Leonel had already tossed back a few drinks, so it could have been the alcohol talking as much as it could have been an attempt to stir emotions. Having asked Macky2 to deliver a shout out on his behalf during the task presentation, he was upset that his request had not been granted. He flew into a tirade, telling Macky2 he did nothing in the house and even called him a fake. Butterphly, having settled down after her own clash with an ex-housemate, tried to calm the rising tension. 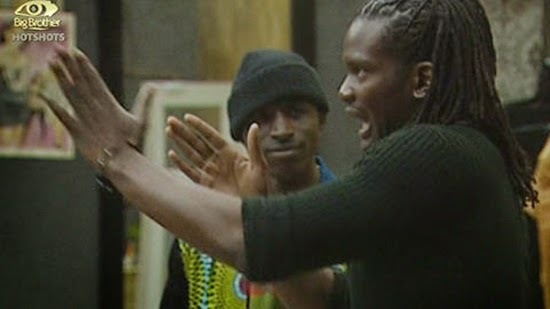 However, Macky2 showed incredible restraint, not allowing Leonel to upset him. He agreed with everything he said, even saying, upon being accused of always sleeping, that he would carry on taking naps. He walked away from the situation, saying that Leonel would be apologising to him tomorrow, just as he had done with other housemates. Leonel disagreed, saying he would say the exact same thing to his face the following day. The next rebuke from Leonel was telling Macky2 that he wanted people around him to do everything and then take the credit. Sipe tried to intervene, but Macky2 said he was fine. He did not rise to the bait once, nodding assent when Leonel reiterated that he did nothing. He did not even get upset about any of the remarks about his music career or when Leonel chucked his drink at him. What did you think of the confrontation? Leonel is telg tha truth mack 2 is just fake !!! Feeling him self as knowin it all .....Africa wke up such pple shd go home we dt intertain bores!!! He had a chance but he is runin it. Tayo insult so called "Small Countries" eg. Botswana,zambia,namibia,mozambique&malawi whose population combined is less than Lagos city population. says he is representing 200 million people. That shows how his little brain is and his too proud for nothing empty vessel. Of all Nijas who attended this show he is worst they brought this time around. He even doesn't listen to his co-country celeb. Tayo never insulted smaller countries. I watched the whole bruhaha. People should stop misinterpreting tins. He only said he is not a failure and that he represents a country of over 200 million people. He never insulted any country peeps. Get ur facts right. If u were in his shoes u would do the same to defend ur pride and ego which Miss Pee intentionally trampled on. Tayo is undoubtedly crazy. Why did he bring de population,was it necessary,Bots w r about 2 million,does dat make us less of a country.I watched the whole thing...no brains..empty vessel. Botswana, Namibia, Malawi, Zambia, Mozambique and any other "small" country in Africa- tayo doesn't need your votes, don't accept to be insulted!!! if he can insult and demean you publicly like that what more where the whole Africa is not watching? I know Nigeria has nice people but this tayo boy should not be allowed to tarnish the image of Nigeria-he is a wrong representative of that good country, let him be voted out!!!! You are all very foolish and worst than the TAYO you gossiping. Boko haram actually sneaked into Nigeria from your countries. Jow can all of you be so callous. If Tayo gets to entertain people you get upset and jealous because your boring reps cannot. All of you insulting Tayo are the EMPTY VESSELS. You are very sad people. Grow up joor! And stop telling lies against the poor boy. He is not trying to pretend like your sad selves. May God forgive you for insulting Nigeria when you really cant do without HER. WARNING! Stop insulting Tayo. You are far worse. You are not even in the house and you are all behaving badly through your comments. You should also stop disrespecting Nigeria. Empty vessels. Wether Nigeria is 200m equivalent to one country vote is inconsequential. Nigeria has saved your reps many times. So go and sit down in the dustbin all of you saying negative things about Nigeria and Tayo. And please stop sending your boko haram to Nigeria. So you all prefer people who gossip others at the back to Tayo who confronts them and tells them as it is. Tayo should keep telling it as it is. I watched everything, he never disrespected any country. People should learn to be honest and stop being cowards. Us Nigerians we don't need ur votes SADC and EAC for King Tayo to win. We have numbers & friends all over the world to support our handsome boy, multi-award winning model,talented movie actor& International-acclaimed musician. Fine. Whether he wins or not it really wont stop him from progressing. Your reps are busy pretending all over the place out of desperation. Tayo the King stop gossiping about him. The reason why u hate Tayo coz he got brain compared to the rest of the housemate. Poor SADC,COMESA,IGAD&EAC. Don't you know even audit firm which coordinate votes/eviction is owned by naija tycoon based in SA? Keep on gossiping while king Tayo prepare himself to receive 300,000 USD. please stop seeking for attention , you keep saying tayo insulted some countries and Nigeria has been given there vote to some small countries that are entertaining in the house. Tayo for the money. No discussion about that. King Tayo we salute you. Ugweee. Bring the money home oooh! Yaaaaaaaa!!! !the only thing I didnt like about Tayo was the extent to which he went to insulting Miss P the words used were too much. However, provocation may result in different reactions dats why Macky2 reacted like that the night exes entered BB house and was condemned. Lets analisy issues before condemning. We wil c about that. Macky 22222 you are not hated but a threat dats why they talk about you because if you are boring and not competition why shud poeple be bothered. You are winning and I strongly see this coming. Haters, tayo don't insult any country, I watched big brother al day, he just clarify wat Miss p said ' failure ' we r human, let's live game aside. Tayo the great and the greatest! May God bless you. Tayo the wachest.can't imagine how his baby mama felt when he was insulting miss p. I couldn't listen to those nauseating words from a claim model to a lady. its surprising how people seem to ignore or refuse to see mistakes from people, regardless of where we come from we should atleast have manners if we cant afford them lets try common sense. you"ve got to understand that Africa is a continent and not a country, hence Tayo should learn to deal with people from different cultures. As handsome as he his it makes him look immature I think he can do better than that. he should not be loud all the time that's not bba Nigeria but bba Africa. its good to be calm like butterfly or better still macky2 that' separates men from boy. Even sibblings from the same womb fight, so wats the big deal here? Y'all are lookn for excuses to give Tayo a bad name..... It will not work ok, thats why he is the Craziest of them all!! What I am saying is that the so called small countries must vote wisely they know people who do not insult them about being small but small as they are......their vote count.....one country one vote......vote for a winner and not vote for insults.....3 or more votes from so called countries takes a true housemate closer to the dollars let them insult you but keep on voting wisely. Attention seeker can go to hell you don't need to tell African what to do, Nigeria has been voting for some countries of there choice ever since the game started , so what is your problem with small and big is a game and we are all human. My problem is you and your Tayo keep voting for him and see will one vote take him.......hahahaaaaaaaaaaaaa.